When the 903cc Z1 was launched in 1973, it produced an unprecedented 82bhp, went to the top of the performance and sales charts, and heralded Kawasaki’s arrival as the manufacturer of powerful, robustly engineered four-stroke superbikes. That’s still the image that the firm trades on, getting on for half a century later. You can make your own mind up about which current Kawa comes closest to being a modern equivalent of that first Zed. 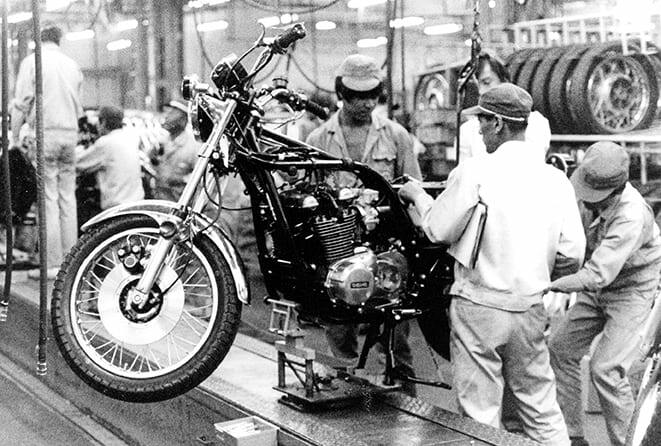 There can be no single successor, because back in 1973 one bike did it all. The Z1 combined handsome looks with the all-conquering performance of a ZX-10R, the straight-line stomp of a ZZR1400, the touring ability – compared to its similarly unfaired peers – of a 1400GTR, and the wow factor of the Ninja H2. Tracing its heritage is complicated, because Kawasaki’s four-pot family tree has many branches, even if you discount side-shoots such as sub-600cc models. But updates were minimal at first, because the Z1’s success and reliability meant that few changes were needed. As well as selling in huge numbers worldwide, it took four straight wins in Australia’s Castrol Six Hour, the world’s most prestigious production race. For 1974 and ’75 the Zed got only finish and detail updates with the Z1-A and Z1-B, which were most notable for their fresh paintwork: two-tone Candy colours and tank stripe combinations that scream Seventies like a tank-top and flares. 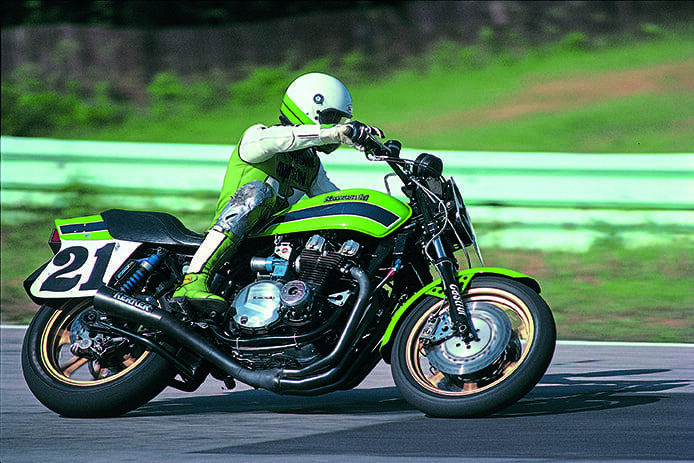 For ’76 the bike was renamed the Z900, but its main changes were the second front brake disc fitted as standard, and smaller carbs that improved emissions but trimmed maximum output to 81bhp. 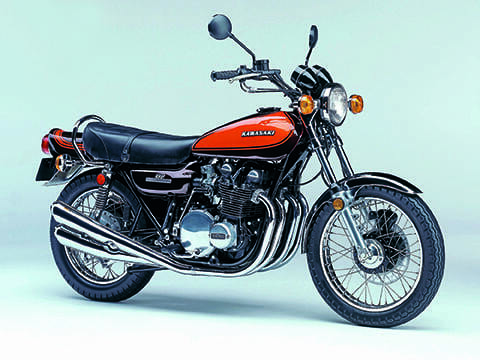 Increasing capacity to 1015cc to create the Z1000 in 1977 enhanced the Kawasaki’s already strong engine, but didn’t address its handling limitations. Nor did the striking Z1-R café racer, with its angular styling and bikini fairing, which arrived in 1978 – the same year that Suzuki’s GS1000, its engine clearly based on Kawasaki’s design, took Japanese superbike chassis technology to a new level. America’s enthusiasm for the ‘Zee’ led to contrasting late-Seventies oddballs. The KZ1000 LTD cruiser had a stepped seat and short pipes; the Z1-R TC Turbo was a hotted-up version of the standard model, created by the US importer, that boosted power to 125bhp and came with no engine warranty, for good reason. The more sensible Z1000 ST, launched in 1979 (while Kawasaki was also debuting the Z1300 six), featured a larger tank and tubeless tyres along with its shaft final drive system. Kawasaki began the Eighties with the Z1000J, a fuel-injection pioneer that featured angular styling and increased, 96bhp output. In 1981 the new four-pot flagship was the GPz1100, which had a striking red colour scheme and a 1089cc engine whose 108bhp output made it the world’s most powerful four. Zeds remained competitive on the track, notably in the States where Eddie Lawson rode a high-handlebarred ‘green meanie’ to AMA Superbike titles in 1981 and ’82. That inspired numerous replica specials and a disappointing production model, 1983’s Z1000R, which offered attitude but not lime green paint. The same year’s GPz1100 took a step forward with its half-fairing and Uni-Trak monoshock suspension, confirming that the era of the unfaired, air-cooled, twin-shock dinosaurs was ending. Kawasaki’s GPZ900R emphasised that in 1984 with its full fairing and 16-valve, liquid-cooled powerplant. Belatedly differentiated by its upper-case ‘Z’, the Ninja became a huge star (especially when ridden by Tom Cruise in Top Gun) and would survive the decade. By contrast the GPz1100 was soon dropped, as was another exciting four, the ZX750 Turbo, with which Kawasaki joined the Japanese firms’ brief craze for forced induction in 1984. The Zed family grew during the mid-Eighties, sometimes successfully. The big GTR1000, introduced in 1986, established the touring family that would lead all the way to the current 1400GTR. But the same year’s sportier GPZ1000RX was heavy and short-lived, while the more agile GPZ900R that it was intended to replace would survive the decade. Kawasaki finally created a fitting follow-up in 1988 with the ZX-10, whose 997cc engine made 137bhp. The ZX’s outstanding feature was the firm’s first twin-spar aluminium frame, which contributed to the bike being lighter than the Ninja. Even so, the ZX-10 was a substantial superbike; as happy two-up and wearing throwover panniers as it was being scratched round a racetrack. Eddie Lawson rode a Zed to AMA Superbike titles in 1981 and ’82. Kawasaki tried to revamp its faithful air-cooled, two-valves-per-cylinder Zed format for the Nineties. With retro-bikes fashionable among ‘born-again’ bikers, the firm introduced a Zephyr trio of 1100, 750 and 550 fours, designed to resemble the Z1. Unfortunately the name, meaning ‘gentle breeze’, proved apt; even the biggest Zephyr was softly tuned and dull, with little of the old warrior’s storming performance. The liquid-cooled ZRX1100 that followed in 1997 was a more convincing attempt at a retro four. That model and the ZRX1200, which arrived in 2001 with an enlarged 1164cc engine (in bikini-faired R plus half-faired S versions), were enjoyably grunty musclebikes, but too lumbering to reflect the character of the King that had ruled the roads in the Seventies. Arguably the four that has come closest to recreating the original Zed’s impact was the ZZ-R1100 that Kawasaki unleashed in 1990. Its 1052cc engine, boosted by a novel ram-air system derived from Formula One race car technology, produced 145bhp. That gave the ZZ-R a top speed of 175mph, and a straight-line performance lead that it would hold for the next five years. The ZX-9R would also earn a loyal following among sports bike riders of the Nineties, without matching the pace or sales of Honda’s FireBlade or Yamaha’s YZF-R1. 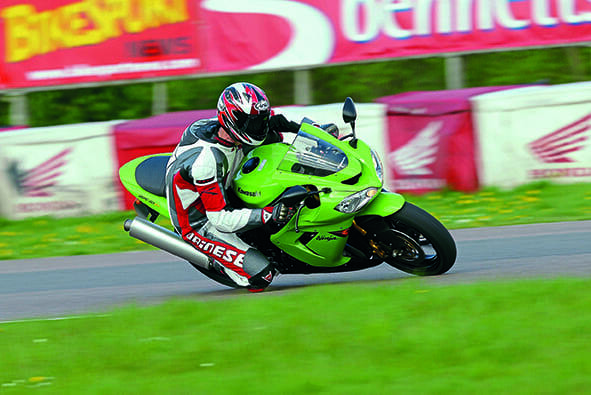 Launched in 2004, the ZX-10R has won four of the last five World Superbike titles. Another Zed that didn’t quite hit the heights was the ZX-12R with which Kawasaki started the new Millennium. Sleekly styled, it developed 176bhp from its 1199cc engine, which was held in a novel monocoque aluminium frame. 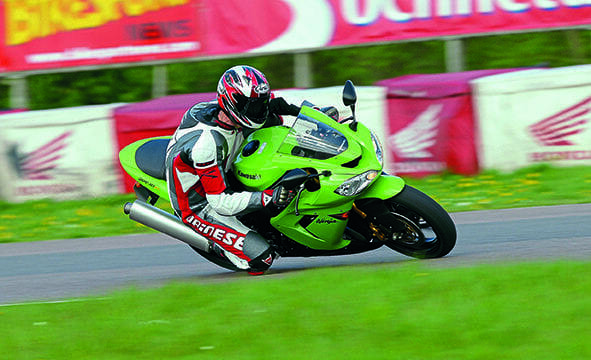 The ZX-12R challenged Suzuki’s Hayabusa for the title of world’s fastest superbike. Yet amid confusion regarding the ZX-12R’s precise output came reports that it was the first bike to be affected by the manufacturers’ agreement to limit top speed to 186mph. The appeal of sheer speed had faded but Kawasaki tried again in 2002 with the ZZ-R1200. That led four years later to the ZZR1400, which remains in the range, a series of updates having taken its ram-air assisted maximum output above 200bhp. Meanwhile one naked branch of the Zed family continues with the Z1000, whose 2003-model predecessor was another landmark. This was the bike that began Kawasaki’s modern era, following the famous 2002 Munich show press conference, when President Shinichi Morita admitted that recent models had “not fully met the expectations of our customers”, and promised dramatic improvements. The aggressively styled Z1000 that followed put the Big K back on track, and was followed in 2011 by the sports-touring Z1000SX that has also been popular ever since. There’s more! 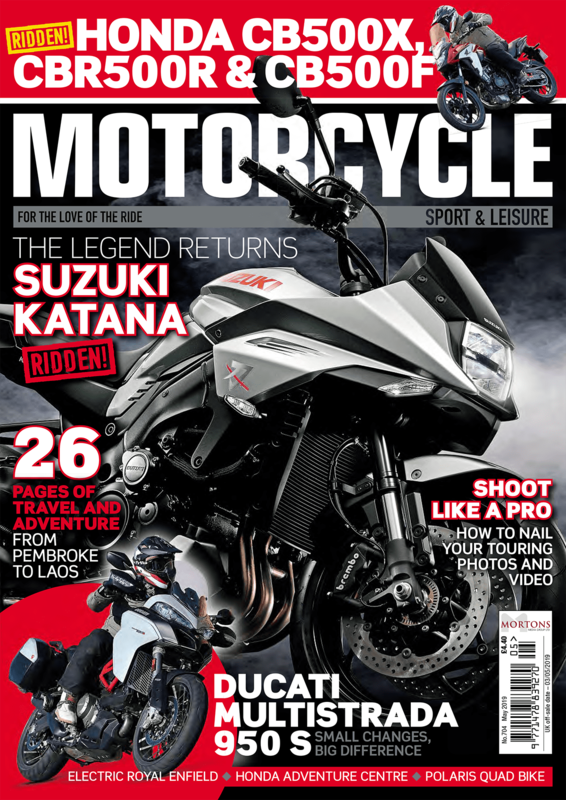 Read more about the history of Kawasaki in MSL February 2018 edition by clicking here to purchase this back issue.